SEO or Search Engine Optimization is a term used to refer to the optimization of many factors to improve your search rankings. Research suggests that 91% of people will not go past page one of Google search results. That means SEO is massively important if you want to get any business from your website. The trouble with SEO is that its a constantly evolving practice and you will find a lot of terrible or outdated information which as a result could damage your rankings. Its basically a case of Google says jump and we say how high? There are of course other search engines like Bing and Yahoo but Google is the one most go to because of this it’s often harder to rank as there is more competition and their algorithms are probably more sophisticated. Let’s take a look at what SEO is as a whole. One schoolboy error for a lot of people is assuming that you create a site get it online and people will find it. Nope, they won’t! If they are searching for something and your site doesn’t show up in the results then how do they even know your site exists? The second error is assuming SEO is all on-page work, again this might help a little but SEO is a term that covers many different elements. Off-Page is as you would think, everything that is not on your site. 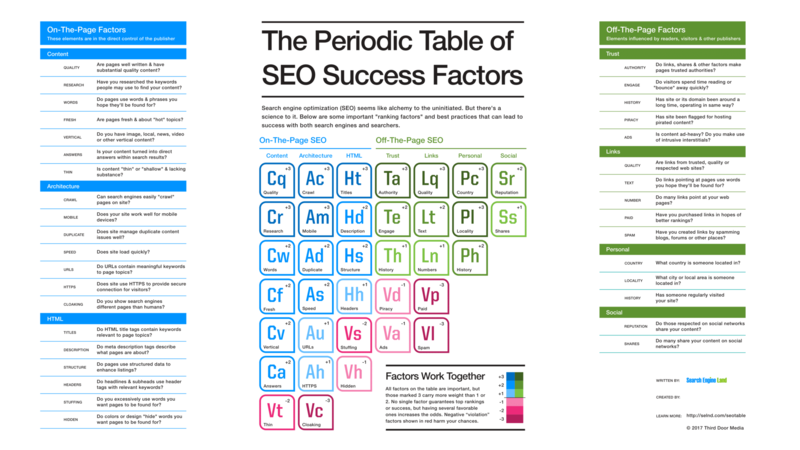 Search Engine Land has created this fantastic periodic table of SEO which should help show you just how much goes into getting your site ranking. As we said previously, it’s not a one-shot deal with SEO, you should view it as an ongoing task. There are several variables that can affect your ranking from Google algorithm changes to competition in the SERPS (Search Results) as other sites improve their SEO. This means you will always need to be working on SEO and adjusting it over time. There are a few basics that you need to know about your site and how it will likely rank. If your site is brand new then you will not have any Domin Authority which is a ranking factor. This is something that takes some time to build up and will ONLY be built over time by doing other SEO tasks. Backlinks again a ranking factor. If you have none or very few then your site is going to struggle to rank. Backlinks and the type of link tell Google if your site is trustworthy and authoritative. On-Page SEO. This refers to the content on your site. Google needs content to be able to ascertain what a particular page is about. If you don’t have enough text on the page google may not have enough to figure out what your page is about and won’t be able to rank it. On the other hand, if you just pack your page with a load of keywords (words you want to rank for) then google will see this and view it as keyword stuffing and rank you down rather than up. This is where you should start as a poorly optimized site is unlikely to gain good backlinks. Think of on-page SEO as the foundations of your SEO task. 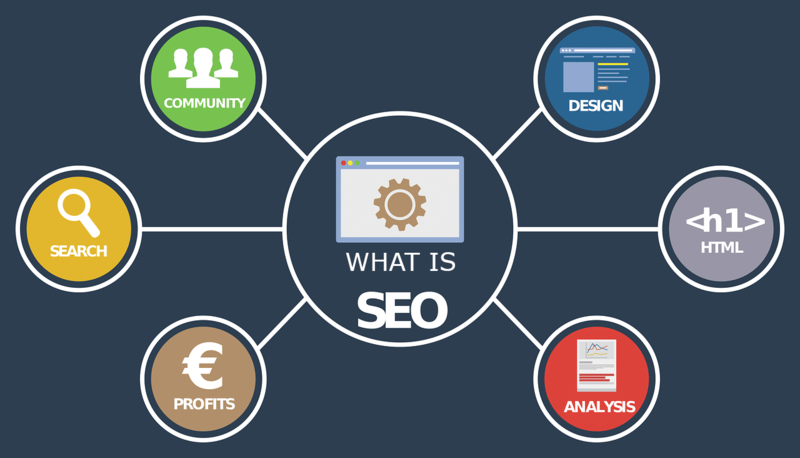 Backlinko has produced a wonderful infographic for on-page SEO which will explain the important elements. As you can see there is a lot that goes into on-page SEO but get it right and your on to a head start. Once you have your website SEO sorted you need to think about off-page SEO. Think of it like this. If someone said to you in the street, oh yeah I can fix your car. You would want to know what their experience is, how long they have been working on cars, are they any good or not. Off-Page SEO is similar, it’s about building up a history and reputation in the industry so Google will see you and your site as a trusted source of information. Now, this is where it gets a little confusing as some tactics are frowned upon by Google. For example, getting backlinks. You can’t just go spamming your links on any old place you can find on the net. This will likely damage your reputation and at worst get you penalized by Google. You need to aim at getting non-spammy links on sites that have a good reputation and domain authority. Indeed a question that is regularly asked! This isn’t as easy as it used to be in the days of emailing similar services and asking to exchange links. Google is more impressed by natural links. What this means simply is that you need to write good content and offer a fantastic service that people will want to link to. So you gain backlinks by not being directly involved in getting the link, its all about content and your reputation. For local small business‘ this is still true but you may not be writing a tonne of content this is where providing a good service comes in. You do a great job and people will share your website all over to friends family etc. While we are on local ranking (Ranking for a business that provides services locally) let’s have a look at a few things you can do. In addition to the above, you will also want to look at building citations this is important for local SEO as it firstly gets your information out there but it also helps with ranking your local business. In some ways, it is easier to rank a local business as there is likely less competition but don’t overlook the element of time. It takes time for SEO to take effect. Many people forget that even if you do all of the above, and you should if you want to rank at all. The work you have put in will not immediately garner results. With most SEO work you will find that it will take around 3-5 months to start having an effect. If your site is new it might take even longer. This is because Google builds up a picture of your site over time. As it crawls yours and other sites it will start to pick up the links and build up the picture of your service and gradually they will rank you. Once you get to where you want to be in SERPS don’t neglect SEO or your competition might just take over you! Remember they will also be doing SEO work. It’s also common to see your site move up and down quite often. Google is always adjusting what it serves to searchers. The bottom line is that Google’s goal is to serve the very best results for a particular search term. I hope this article helps clarify what SEO is and all the elements that make it up. Let us know if this article was helpful in the comments.